In our first sleep training post, we shared a few popular methods you can use to help your baby achieve a consistent sleep schedule. Of course, no matter how persistent you are with sleep training, it is unlikely you will find immediate peace and quiet. 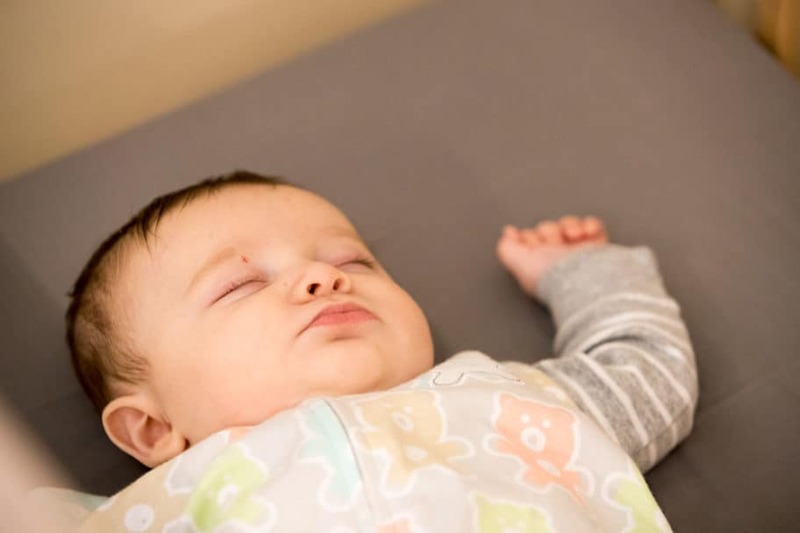 Just as your own sleep schedule can be interrupted by normal events in everyday life, there are many things that can interfere with a baby’s sleep schedule, from their feeding times to exhaustion. In Part II of our sleep training series, we take a look at some individual factors that can influence sleeping behaviors. You may find you are willing to do anything to help your baby fall asleep – whether it’s a midnight feeding, a car ride in the middle of the night or trying to remember the words to a lullaby at the crack of dawn. If you have found that there’s one magic “trick” that helps your baby fall asleep, it will most likely feel as though you have finally cracked the sleep code; in most cases, the best explanation is your baby has built an association between this and sleeping. While solutions such as these are wonderful in the short term, they can occasionally form habits that are difficult to break. Slowly start to remove these triggers and replace them with more sustainable nighttime rituals. Consider what you can do to make your baby’s room an ideal sleeping environment. The room should be dark, quiet, and cool. Make the rest of the house as quiet as possible – if you’re catching up on chores or the latest episode of your favorite show after your baby has finally settled down, try to keep it down! Even soft noises from around the house could be influencing their sleep habits. If you’ve found that one particular sleep training method does not seem to work, you may be inclined to try a new strategy after a few days. Keep in mind, this could prove to be disruptive, as your baby may be growing acclimated to your current method. Try sticking with a sleep plan for a few weeks, while also identifying any other obstacles to a good night’s rest. A sleep log can be a useful tool in tracking what is (or isn’t) working. You’re exhausted – it’s possible your baby is, too. It sounds counterintuitive, but your baby might be too tired to sleep. You know what it looks like: a screaming, flailing meltdown of epic proportions. By learning to identify your baby’s sleep cues, you’ll start to figure out the best time to put them down to sleep. Common sleep cues include rubbing eyes, yawning, rejecting being held, frowning, and an unfocused gaze. As your baby grows, so does the number of factors that can interfere with their sleep. Sudden changes in your child’s sleep routine may indicate physical discomfort. If you have older children, you may have already gone through the nighttime growing pains routine, such as soothing a child with sore muscles. Your baby is having a similar experience (so much growth over such a short span of time! ), though they do not yet have the ability to communicate with you. Similarly, teething can also cause a disruption to an otherwise stable sleep pattern. Sleep training isn’t just difficult; it’s a sacrifice. As you’re losing sleep your baby is (hopefully) getting more! It’s important to care for yourself during this time. • If you’re raising your child with a spouse or partner, work together to share responsibilities. Do either of you have flexibility in your work start times? Is one of you a night owl, while the other prefers to wake up early? Communicating your needs with one another can make for a more peaceful environment for everyone. • Fit in a nap. You might be laughing at the idea of having a second to yourself, but a quick twenty minute nap during your baby’s nap, if possible, can truly be transformative. Make the room as dark as possible and refrain from using electronics. If you’re not able to nap, try guided meditation or some light stretching as a way to reset yourself. Experiment with what works best – there’s no one tried-and-true method that’s perfect for every family. Most importantly, remember that you’re doing the best you can for your baby. Sweet dreams!